We are pleased to share a talk given in July 2013 by Reverend Dr Stephanie Dowrick at Interfaith in Sydney, Pitt Street Uniting Church, Sydney, where she invites us to grow in spiritual strength and wholeness…and to see the reality, truth and strength of our interconnectedness. 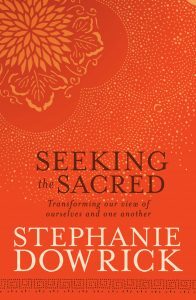 Oddly – or perhaps not – Stephanie was less than perfectly well when she gave this talk which adds depth to the insights she brings to us about our true or eternal nature and how we live and express that. As often before, she brings our attention to choice…and the freedoms that come with our awareness of choice and our power to choose wisely. Please note that all of the recorded video talks from the services that Stephanie leads are available via InterfaithinSydney YouTube link.